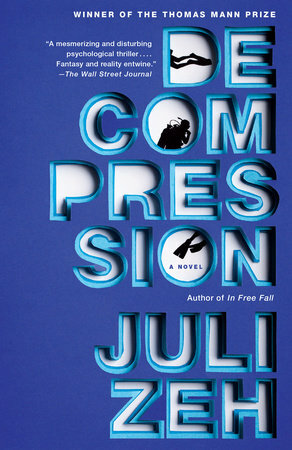 “Decompression,” a novel by Juli Zeh, is the winner of the Thomas Mann Prize. From one of Germany’s rising literary stars: an award-winning thriller, written in the tradition of Patricia Highsmith, that follows two couples caught in a web of conflicting passions while deep-sea diving off the beautiful Canary Islands. In this riveting tale we meet Diving instructor Sven Fiedler and his girlfriend, Antje, who live and work on the Spanish island of Lanzarote. When a tourist couple – Jola, a soap opera actress, and Theo, a stalled novelist – arrive for an intensive two-week diving experience, Sven is captivated by Jola’s beauty and evident wealth. Theo suspects that Sven and Jola have begun an affair, but oddly, he seems to encourage them. Antje looks on, increasingly wary of these new clients. Cycling through different points of view, we are constantly kept guessing about who knows what – and who is telling the truth. A brutal game of temptation and manipulation unfolds, pointing toward a violent end – but a quiet one, underwater, beneath the waves. A London society woman with a secret criminal past and a hit man with an impossible job offer she can’t refuse come together in this relentlessly paced debut thriller. Charlotte Alton is an elegant London socialite. But behind the locked doors of her sleek, fortified apartment, she becomes Karla, a fixer who specializes in creating and erasing identities, and can cover any criminal’s tracks. Only a few people in the world know her secret. 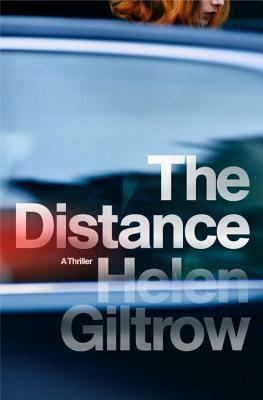 One of them is Simon Johanssen, a killer-for-hire who resurfaces – years after she helped him to quietly disappear – with an impossible job. He needs access to a high-security, experimental prison colony in order to assassinate an inmate. The catch: there’s no record of the target’s existence, and what’s worse, the criminal boss from whom he’s been hiding is inside, too. The trap has been set, but who is the real target – Johanssen or Karla herself? 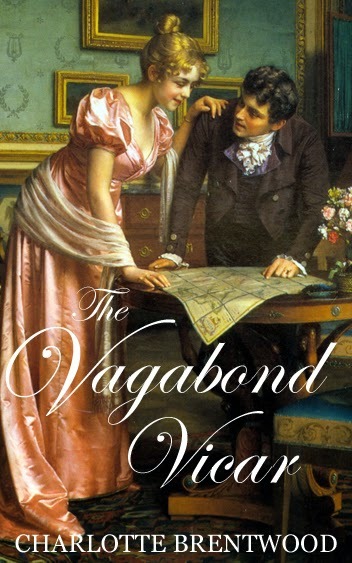 The Vagabond Vicar, By Charlotte Brentwood, Regency Romance, Oct. 15, 2014 release date, 279 pages, e-book, $3.99. William was committed to his calling as a man of the church, but was driven by his need to have an assignment in an exotic land. So when he completed eighteen months as a deacon at St. Mary’s he had hoped rector Dean Roberts, the Dean of the city of London, would provide him with a worthy assignment. Unfortunately, a replacement was immediately needed in a small village in England, after the recent death of the vicar. William makes it appear as if he has moved beyond his desire to be shipped to some faraway land to help establish a church, he simply goes through the motion of leading the people. His heart clearly is not in it, but society has a way of drawing one in. He yearns to have his dear friend Thomas’ post. He was sailing off to foreign lands. While shopping in town, William hears two women talk about the young woman who greeted him with a cake. 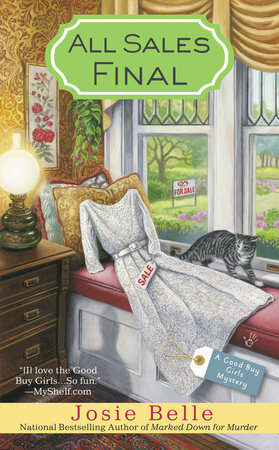 Cecilia is a free-spirited artist who is not interested in marrying someone wealthy. Though, that is the natural weave of society during her era. For a young woman to be married into a family of high-standing must be the only goal in her life, according to her parents. Cecilia is more interested in the well-being of her friend, Amy, a servant in the Barrington manor. She goes along with her parents’ request to dance with the Barrington’s son during a social affair. The only problem is this young man takes what he wants and has no ethical care in the world. Because his family is wealthy, he thinks he can do as he wishes and that includes having a sexual relationship with Cecilia’s friend, Amy. Cecilia finds herself deeply concerned about her friend’s future because her reputation has been damaged. She also finds herself attracted to the new vicar. It is difficult being close to him during services and religious school classes for the children. He feels his future is in another country and he’s not willing to settle for being married and fulfilling his mission in the village. But what he wants, and what he feels, are two different things. Then young Barrington’s parents force him to make a more responsible life for himself. And that’s when the book gets really interesting. I wouldn’t have chosen to read this on my own considering it is a religious Regency. I have to admit that I respected the challenges and attitudes of the main characters and Amy’s, as well. I found the book interesting and looked forward to seeing if Cecilia and William had a chance of finding happiness together. Would William realize that he was on the right path toward his destiny? Would Cecilia be allowed to be the young woman she truly was? Could she marry for happiness instead of a financial arrangement navigated by her mother? 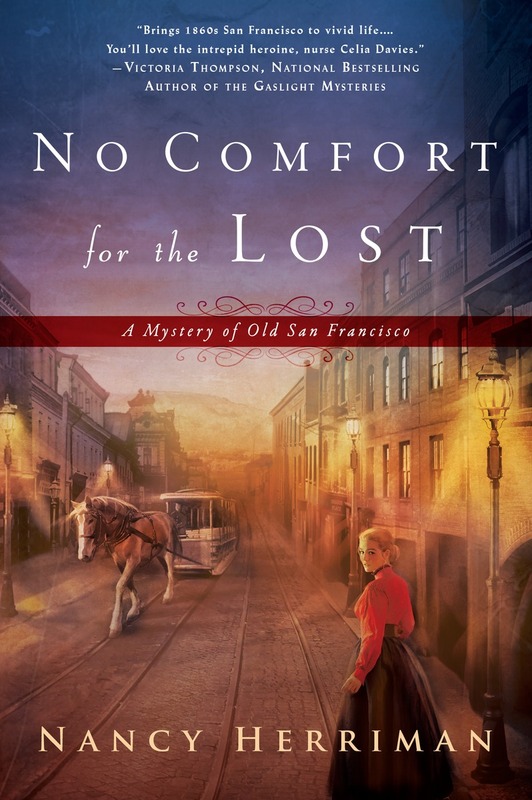 I think this book could be a Hallmark TV station movie. My latest book, Falling Like a Rock, thrusts the heroine, hero, even the entire small town of Falling Rock into danger from a Colorado wildfire. But now I wonder if I should have placed them into the situation. From my quick overview of romances ranging from series sweet to mainstream women’s, many novels appear to rely too heavily on the stereotypical approach. A couple meets, has a few misunderstandings, then fall into each other’s arms. Life’s not that easy. Are romance readers inclined to avoid depressing reality, or can they appreciate how good times become even better when characters live through hard knocks? Just like real life, without the comparison of health to illness, wealth to poverty, and love to antagonism, surely readers gain more from their reading experience if stories reflect some glimpse of real life. I spent years writing and publishing nonfiction, and I got fairly skilled at it. I also spent years writing fiction, most of it not published, but I learned as I went along. The process for fiction writing is simultaneously more challenging and more fulfilling. For me, it depends heavily on intuition and serendipity, along with incorporating incidentals from life into stories. Whether these incidentals happened to me or are the topics of headlines, they provide nuggets I hope make my fiction more true to life. For example, years ago I broke my ankle big time. This was such a major occurrence that the impressions and feelings proved indelible. In my current novel, Falling Like a Rock, I needed a scene to expose the heroine as vulnerable, as well as show the hero’s sensitivity and growing attraction. Out of the dim recesses of my memory crept my broken ankle. I didn’t plot the incident into my manuscript from the beginning, but it served the purpose as the plot developed. Kudos to my unconscious! Although I love small towns, and Falling is set in one, another stereotype I frequently see is an idealization of small town life. Truth be told, only 20% of Americans live in rural areas or small towns, and many of their residents are battling to escape their low employment rates and sometimes rigid views of life. Why set so many novels in them? The stereotype that irks me the most is the tendency to isolate characters within a group sharing a particular background. Get with it, I want to spout. Most Americans have friends and colleagues of all different ethnicities, as well as associates who have various disabilities. (Really, aren’t we all disabled in some fashion?) While I don’t believe in beating a drum or raising a fuss, I make it a point to include diverse characters in my work. The more everyday fiction features mixtures of people, the more we’ll see similarities among all humans as normal in our daily existences. My blog, “ordinary people, extraordinary lives,” articulates the same approach as my fiction. None of us needs to be flamboyant or rich or aggressive, on television or splashed over the Internet, shrieking foul language or parading in flashy clothes, or even simply annoying, in order to be interesting. Many of us have fascinating, productive existences, packed with creativity and good will, and are thrilled with the pageantry of life. We’re curious. We’re thoughtful. We’re generous. Does that attitude grab your attention? What do you think? Bonnie McCune credits tenacity for the successes in her life. Since fifth grade, she’s been determined to be a writer. 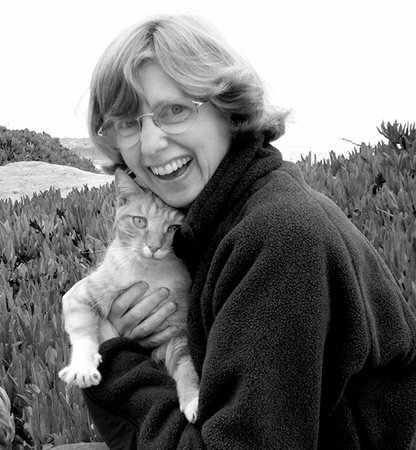 Thousands of rejections along with some acceptances taught her the craft, and after decades, she decided to follow her passion, fiction writing. Her recent novels are proof of her persistence. Her interest in writing led to her career in nonprofits focusing on public and community relations and marketing. She has worked for libraries, directed a small arts organization, and managed Denver’s beautification program. Her civic involvement includes grass-roots organizations, political campaigns, writers’ and arts’ groups, and children’s literacy. Simultaneously, Bonnie’s been a freelance writer with publications in local, regional, and specialty publications for news and features. A secret love—live theater, and had she been seven inches taller and 30 pounds lighter, she might have been an actress. For years, she entered recipe contests and was once a finalist in the Pillsbury Cook Off. Funny and frank, poignant and perceptive, when two people are “Falling Like a Rock,” they learn surrender sometimes means victory. Knit One, Purl Two, oops who killed the bagpiper? Find out in Molly’s new book. Molly MacRae, national bestselling author of Plagued by Quilt, Spinning in Her Grave, and Dyeing Wishes, was director of the history museum in Jonesborough, Tennessee’s oldest town, and later managed an independent bookstore in Johnson City. 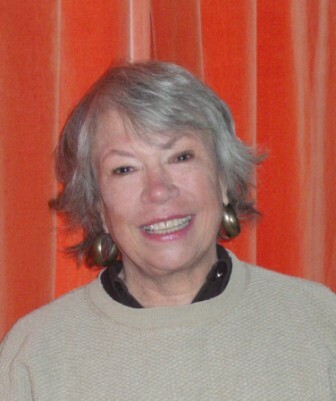 Her short stories have appeared in Alfred Hitchcock Mystery Magazine for more than twenty years, and she has won the Sherwood Anderson Award for Short Fiction. 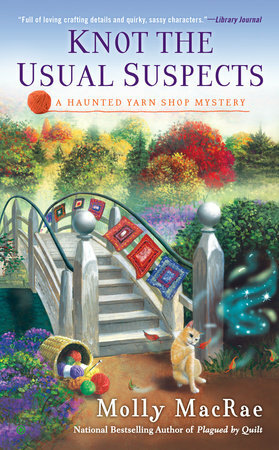 Knot the Usual Suspects, A Haunted Yarn Shop Mystery, By Molly MacRae, Obsidian, paperback, 352 pages, $7.99, Sept. 1. 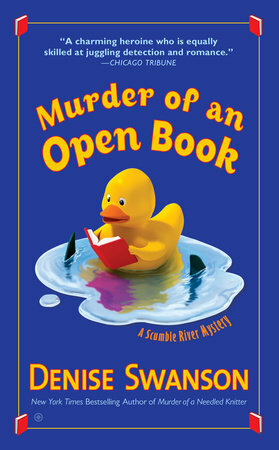 Murder of an Open Book, A Scumble River Mystery, By Denise Swanson, Obsidian, paperback, $7.99, 257 pages, Sept. 1, 2015. A nasty faculty feud leaves one Scumble River teacher belly-up. . . . Her honeymoon may have been less than relaxing, but Skye Boyd (née Denison) is still high on marital bliss with her new husband, Wally. The fact that their family is about to get bigger is even more exciting, even if Skye is dealing with morning sickness—and trying to hide the news from her ever-meddling mother, May. But Skye quickly comes crashing down from cloud nine when the body of one of her coworkers, science teacher and volleyball coach Blair Hucksford, is found in the school swimming pool. The troublesome trainer was on the bad side of almost everyone on staff and many of the girls on her team, leaving Skye to sort through a huge roster of suspects. 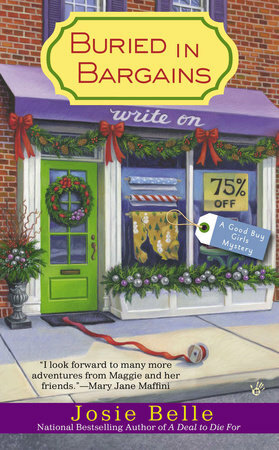 Now she must figure out which wronged party was mad enough to kill, and quickly—before someone else in town gets bumped off. . . .
Maggie’s impending wedding finds her more concerned with a cold case than cold feet in the latest from the author of Marked Down for Murder . . .
There’s something 100% off about Maggie and her fiancé Sam’s new dream home in the historic section of St. Stanley. The lights flicker, the doors blow shut, and their cat, Marshall Dillon, hisses at empty space. And there’s something in the basement that’s definitely not a bargain . 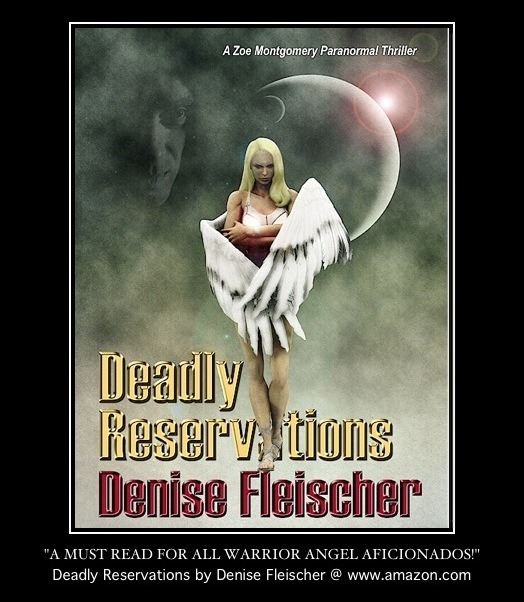 . .
After Maggie discovers a skeleton in the root cellar, she’s convinced her house is haunted by a murdered man’s ghost. With the help of her Good Buy Girls, Maggie works to tag a killer. But she’ll need to be careful as she digs into the history of her new digs. Someone is willing to keep the truth buried at all costs . . . 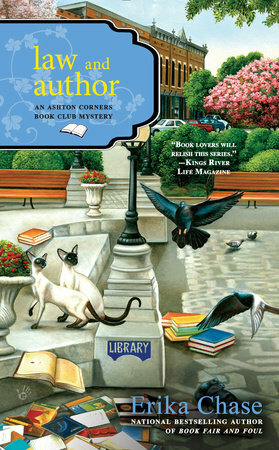 The author of Book Fair and Foul reconvenes the Ashton Corners book club to solve a murder in their own backyard . . .
Bob Miller, retired police chief and member of the Ashton Corners Mystery Readers and Cheese Straws Society, is stunned by the arrival of his twenty-one-year-old granddaughter, Darla, whom he has never seen. Bob has been estranged from his own daughter for decades and hopes to make up for his absence in Darla’s life. But some of the ladies of the book club find their Southern hospitality strained as they question the motives behind this sudden reunion. After a dead man is found in Molly Mathews’s backyard, their concerns grow more serious. Lizzie Turner saw Darla arguing with the stranger the day before, but when the police question her, Darla proves to be an unreliable narrator. 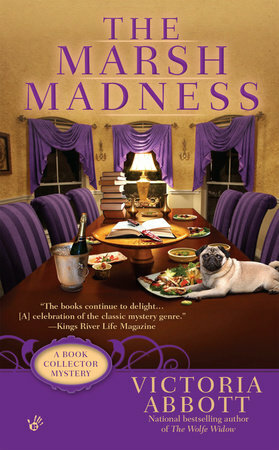 It’s up to the book club to uncover the real story . . . before another victim is written into the plot. 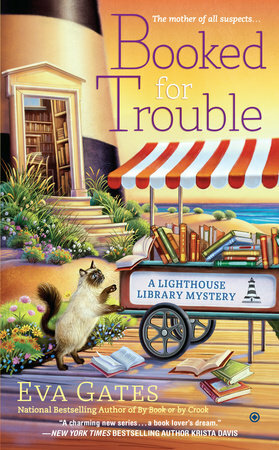 Victoria Abbott is a pseudonym for a collaboration between seasoned mystery author Mary Jane Maffini and her daughter Victoria. 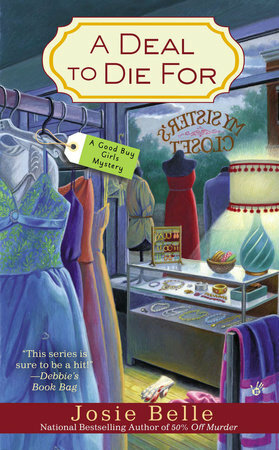 Mary Jane, a former mystery bookstore owner, is the author of the Camilla MacPhee, Fiona Silk, and Charlotte Adams series. They live outside Ottawa, ONT.